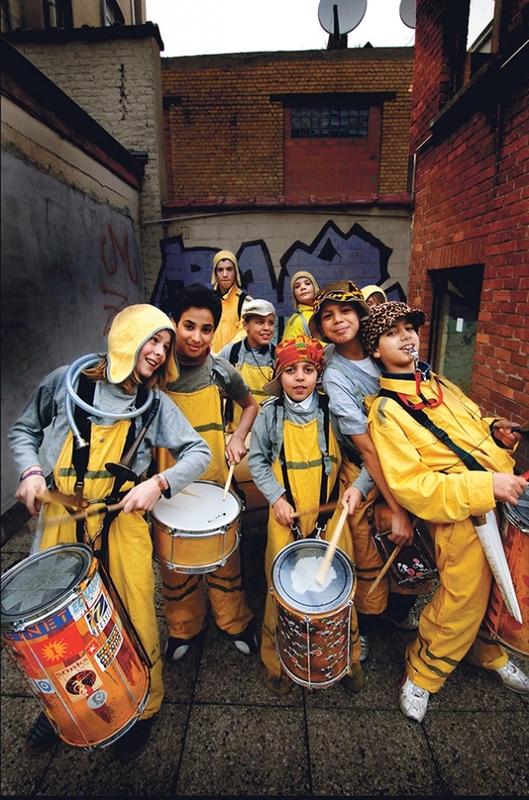 Emerged from the first Zinnekeparade in 2000 and never missed a single edition since: The Fanfakids are definitely the most dynamic group of young musicians that enriches our capital. They are a fresh group of twelve unrestrained kids (between 7 and 15 years) who transform their youthful enthusiasm into a contagious mixture of South-American and (north-) African rhythms. They smash, hit and hammer their self-made drums. Representing the Brussels metropolitan sound with the greatest sense of self-esteem, they can hit off any unsuspecting audience: nothing posed, nothing fake, honest and energetic, right in your face! Fanfakids’ record at home and abroad, despite their youthful age, is already impressive and their gaming pleasure guarantees a good “party vibe” at every stage, street or support act. The Fanfakids are extremely popular and have been in existence for over 15 years. At that time, they had a close relationship with different drum and dance groups from Guinea and Ghana, where they traveled to rehearse and recharge musically. Disarming energy!